Marisa Peacock is the principal and chief strategist for The Strategic Peacock. As a social business strategist and marketing consultant, Marisa helps organizations create and implement online strategies that appropriately target the right audience with the right information using the right media. Additionally, Marisa is also an adjunct faculty member at Maryland Institute College of Art (MICA) teaching Social Media Marketing as a part of the Masters in Business of Art and Design program. 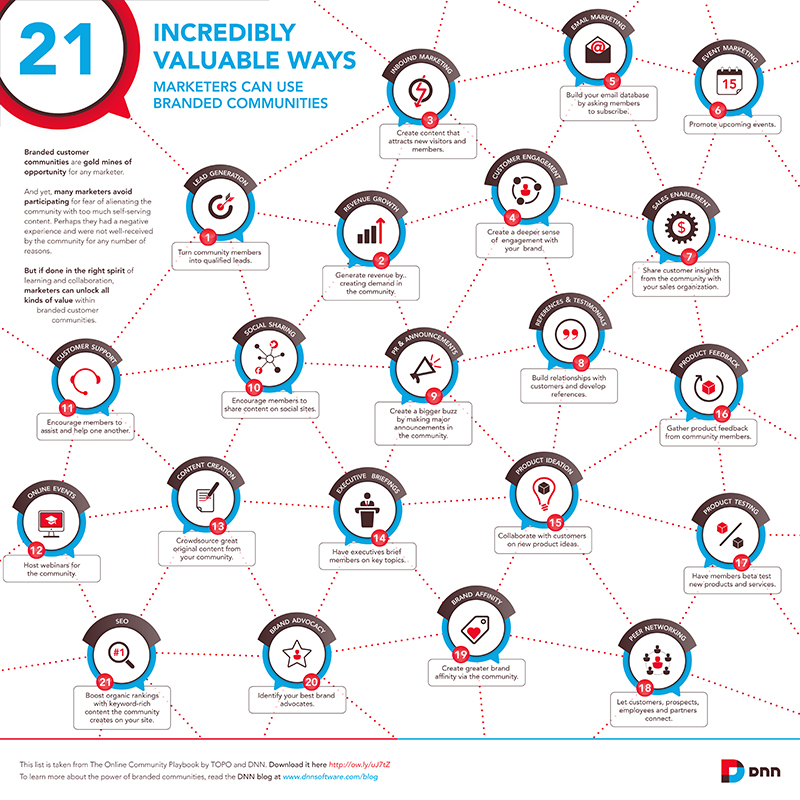 We’re working our way through the twenty-one ways marketers can use branded communities to engage customers. Previously, we’ve learned how branded communities can generate leads, grow revenue, create valuable content, engage customers and build a robust database of contacts. Now, we’ll explore five more ways marketers can further leverage the power of customer community. Branded communities can serve a variety of purposes, but marketers are rarely able to maximize their effectiveness. In order to unlock their full potential, marketers need to look beyond the most obvious benefits. Online event marketing can help attract new customers, build your company brand, and increase revenue. However, coordinating an event, whether it’s an online webinar or networking event, requires strategic promotion. By using a branded community to promote an event, marketers can maximize registration and attendance, as well as create workflows for following up and converting participants afterwards. Furthermore, a community can be used to promote an event on behalf of a company. Events can be targeted strategically to give new and existing community members a voice to let them share their stories, which can motivate others to attend and participate. After an event, a branded community offers a familiar and trusted environment for attendees to connect with one another . Who knows more about how your company’s sales process works (or doesn’t) than your customers? After all, your sales pitch and engagement played a role in converting prospects. A branded community provides an opportunity to learn just how big a role. Asking community members for feedback about the sales process can give them a voice and make them feel more connected to the company, while providing valuable information that your sales and marketing departments can learn and grow from . A branded community offers members a safe and trusted platform through which they can recommend, refer and leave testimonials. Regardless of the type of relationship you’ve built with your customers, you’re still a marketer. In order for them to make a well-informed decision about products and services, they’ll want to rely on the advice from others just like them. In its Local Consumer Review Survey 2013, BrightLocal.com found that consumers tend to trust what they read, with about 8 in 10 saying they trust online reviews as much as personal recommendations. By incorporating customer-generated reviews into your branded community, members can trust that they’re getting the right information they need to make the best decision. A majority of company announcements may never get shared with customers. Whether it’s a report about quarterly revenues, mergers and acquisitions, or information about new products and services, most customers can benefit from the stories your company tells. Traditional press releases may still be relevant to the media, but to your customers they seem stale and outdated. A branded community presents a unique opportunity for companies to share news and information with members in a way that encourages them to comment, ask questions and learn more. Don’t just post a press release, though; instead, write a blog post explaining the impact of the sales reports, post a video featuring the new CEO or host a live discussion with a product team. By positioning your announcements in a more engaging format, marketers can foster more buzz within the community , which can result in more support and increased customer loyalty. A recent study from the NewYork Times Customer Insight Group showed that 94% of consumers carefully consider how the information they share will be useful to the recipient, while 68% said they share to give people a better sense of whom they are and what they care about. As marketers, it’s essential to give customers something worth sharing. At the most basic level, branded communities should allow members to share content via social networks through social sharing buttons. Branded communities can also offer more advanced opportunities for facilitating social sharing. By identifying, recognizing and rewarding customers’ social sharing behavior, marketers can engage with super fans on a regular basis, while making them a part of their marketing mix. Most importantly, marketers can learn from what customers are sharing and what they’re saying. As a result, marketers will need to rethink how they reach their customers and recognize that they play a significant role in how a company’s message is developed. 10 Down, 11 to Go! By now, you have learned about ten ways to use branded communities to boost your marketing efforts. But your toolbox isn’t yet complete: eleven more compelling ways still remain.